One-way video interviews have a unique potential when it comes to interview questions. You see, one-way video interviews provide candidates with time to craft an answer before recording and submitting their video responses. Thus, you get a chance to see what a candidate can come up with when they put some time and thought into your questions. This helps test presentation skills, work ethic, and thoughtfulness. Here are some great video interview questions for your next one-way video interview (because you can always watch a candidate think on their feet in the live or in-person interview). The first time I was asked this question, I wished I had more time to answer it. Most of us (I think) have a good example of this situation buried in the back of our brains. This question is great for a one-way video interview because you’ll get a better story out of your candidates than if you tried to ask this on the fly. You’ll actually get a more accurate answer. Like the previous question, this is a great video interview question to give candidates some time to answer. This one could even allow candidates some time to research a bit about your company. The success with which the candidates answer this question will give you some ideas about their level of interest in your company and position. 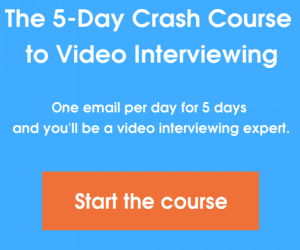 This is another video interview question that will net you more interesting answers with a one-way video interview. Allow candidates to really evaluate themselves, and apply that information to your specific business’s needs. Like the question about a difficult situation, this is one that most of us probably have a great answer to. But, we might have a hard time thinking of a good example on the fly. For any of these questions, could candidates make something up? Sure. However, you should always feel free to follow up on any one-way video interview answer in an in-person interview. We’ll also trust your ability to detect lies. Finally, one-way video interviews are a great time to ask about specific duties for your open position. An employee would have time to think critically about his/her job. Give your candidates the same courtesy with this video interview question. Toss out other questions that work well for one-way video interviews in the comments!